Last year, Trout posted a 10.0 fWAR (Fangraphs Wins Above Replacement) which was 4.8 wins more than the next closest Angel, Torii Hunter. 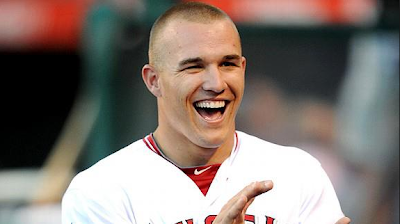 In 2013, Trout put up an even more ridiculous 10.4 fWAR good for 7.7 more wins than second place Howie Kendrick. Trout is the best player on the Angels and in baseball and should win every award from AL MVP to an MTV Video Music Award (highlights set to music) to both a daytime and nighttime Emmy (brilliance during televised games). He'll likely have to settle for the majority of Player of The Year awards handed out around the Internets including mine featuring a trophy made out of various kitchen appliances and cat hair. It's unfair to squarely point the finger of shame at Jerry Dipoto and his front office without knowing how much influence Mike Scioscia still has and how much overruling is done by Arte Moreno. But for the second straight year, the Angels added one of the biggest and worst contracts of free agency to their payroll by signing the woefully underperforming Josh Hamilton. That move killed flexibility and cost the Angels a first round draft pick their shallow farm system desperately needed. 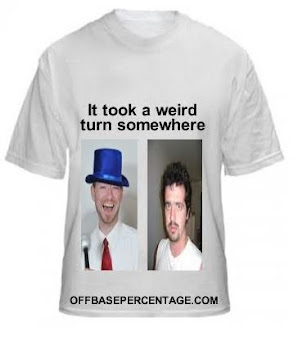 Joe Blanton and Tommy Hanson were more punchline than answer to the rotation question. Wilson had a fine season with a 3.51 FIP over 212.1 innings. So, at least, he's been a workhorse since joining the Angels. I wanted to make a case for Garrett Richards who posted a 3.61 FIP of his own over 103.1 innings as a starter. Richards also increased his GB% all the way up to 57.9 and hopefully he'll start missing more bats with his heater next season when he's guaranteed a rotation spot. How bad was Blanton in 2013? Roughly the equivalent of treating food poisoning with a gallon of Mexico's finest Montezuma cursed water. Blanton's 6.04 ERA was the worst among pitchers with 100 innings pitched. Jason Marquis, Dylan Axelrod, Lucas Harrell and Scott Diamond were the only pitchers who managed to fielding-independently-pitch worse than Blanton's 5.12 FIP. I wonder how much Arby's shame eating Blanton has endured this young offseason. Red headed and left handed. If it was the 1920's, he would have been sold off to a traveling freak show. Instead, he hit .282/.347/.462 in 222 plate appearances. Calhoun had the second best OBP, SLG, wOBA and wRC+ on the team after that Trout guy. While JB Shuck received more playing time and rookie fanfare, it's Calhoun who might have a shot at being an average major league outfielder. Calhoun is no Gold Glover in the outfield but he has more of a general idea of what to do with a glove than Shuck who I'm pretty sure wore his as a hat for more than one inning. The Angels bullpen wasn't great in 2013. In fact, only the Yankees, Mets, Phillies, Cubs and Astros had stats worse than the Angels' 3.90 FIP. I was tempted to give Reliever of the Year to David Carpenter since he only spent a third of an inning in the bullpen but his 108.00 ERA prevented that. Dane de la Rosa was the best of the bunch but his 1.1 fWAR would make him around the 34th best reliever in baseball according to WAR. Roth gets my vote for being a quick mover (drafted in the 9th round in 2012) and posting a 2.15 FIP. Of course, he had a 5.94 ERA over those 16.2 relief innings so it's not exactly a ringing endorsement either. It deeply saddens me to hope Brian Wilson's beard occupies this spot next year.